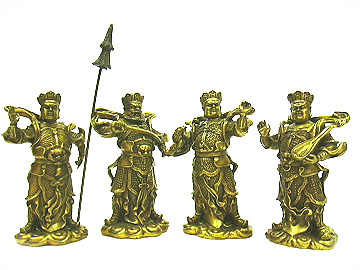 Four Heavenly Kings are very popular among those who practice feng shui, especially those who reside in Hong Kong. In Hong Kong, even the four most popular singing idols were nicknamed after them to provide powerful protection for the entertainment business in Hong Kong in the nineties. Their names alone create incredible aura and auspiciousness to the surrounding. In Buddhism, they are known as guardians against the wicked and evil. Their main duty is to protect the heaven from havoc and their images are popular in main shrines of all temples. Their presence would powerfully kill off negative chi, harmful evil spirits and bad influences. 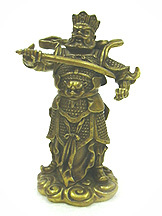 One can choose to place them two figurines on each side of the living hall or in four cardinal directions to protect you from any danger and harm from any direction. Feng Shui Masters in Hong Kong especially like to recommend their presence in the living hall facing the maindoor to protect against any harmful people, robbery and mishaps. . They are most suitable for homes, lobbies, mansions and business premises in important areas. What Four Heavenly Kings symbolizes and how to place the object? The Four Heavenly Kings were four Indian brothers and later worshipped as protecting deities of Buddhist sanctuaries. Their presence in your surrouding will cure any wicked energy coming your way. For those who feels there is evil energy in the surroundings, their presence will provide you with relief. All negative forces will stay under control with their presence. North Heavenly King (Mo-Li Shou) guards the north. He has a black face and he carries along an evil eating creature and sometimes a snake to kill devils. He sometimes also carry a pearl on his hand. 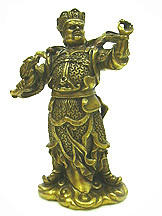 East Heavenly King (Mo Li Ch'ing) guards the east. He has a white face with ferocious expression. He carries a magic sword. He is able to produce black wind that produces tens of thousands of spears to turn evil spirits into dust. South Heavenly King (Mo-Li Hung) guards the south. He has a red face and holds a magical umbrella. This umbrella can produce thunderstorms and earthquakes during battle with demons. 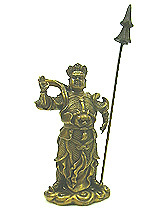 West Heavenly King (Mo-Li Hai) guards the west. 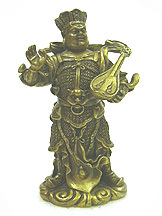 He has a blue face and carries a chinese magical "pi-pah" (musical instrument like a guitar) where the sounds of it could put evil spirits and harmful forces to rest. 1. They can be placed at their four respective sectors of your living room to promote positive thinking. This would enhance the character and attitude of your family members to help them in their pursuits. 2. They can be placed to face the main entrance (looking outwards) to ward off evil spirits and harmful forces and killing breathe. 3. They can be placed surrounding a Buddha image or in front of the Buddha to activate their potency in bringing the support you need for protection purposes. 4. Their images can also be placed to protect precious items/treasures to ward off burgalary and thefts. 5. If there are killing forces coming your way, place them facing the killing forces such as straight path directly leading towards you, bad energy coming from construction sites, graveyard etc. Note: Kindly do not place deities in toilets, kitchen and on the floor.